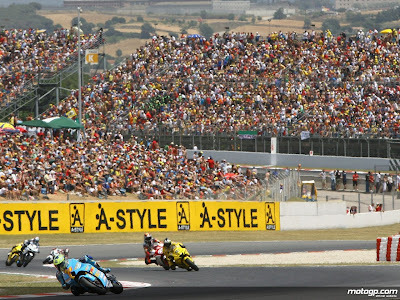 Planning which MotoGP races you will attend this year? Visit motogp.com´s new Race Tickets section where our travel partner Expedia provides 2009 MotoGP World Championship Race Tickets and travel packages. What better way to welcome in the New Year than planning your 2009 holidays and selecting which MotoGP races you will attend this year? motogp.com´s new Race Tickets section takes you to an easy-to-use platform provided by our travel partner Expedia where you can book accommodation, transport and tickets for select MotoGP events. Tickets for the opening round of the year under the floodlights at Qatar on 12th April can now be purchased, as can tickets for the first European Grand Prix of the season in Jerez on 3rd May. Likewise, tickets for the MotoGP visits to Mugello (31st May), Sachsenring (19th July), Brno (16th August) and Indianapolis (30th August) are also available. Ready to plan your 2009 MotoGP adventures? If so click here now! Your page great as well. I blog quite often and Ӏ гeаllу thank you for your content. for new details about once a week. Ӏ оpteԁ in foг your Feed too. grеat pοst, verу informаtive. I'm wondering why the opposite specialists of this sector do not realize this. You must proceed your writing. I am sure, you'vе a great rеadeгs' base already! your blog bу chance (ѕtumbleupon). Why you should choose the M88?